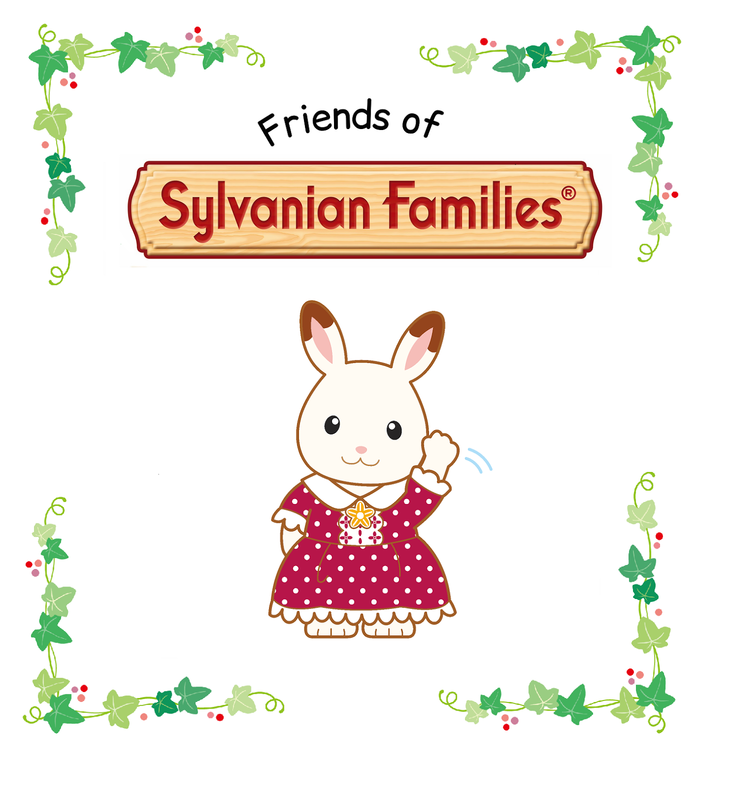 In December we were lucky to receive the beautiful Sylvanian Christmas set through the post to review. 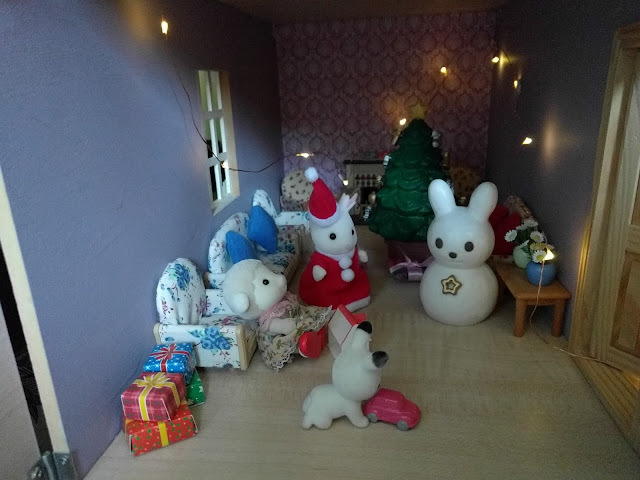 In the mountains of all our Sylvanian items we didn't have any 'official' Christmas items, usually just making use of Christmas items from other toys...a Lego Christmas tree and snowman, an old HappyLand Santa so it was lovely to receive some 'proper' items for our sets. The set arrives in the new style packaging, looking all vintage and lovely. 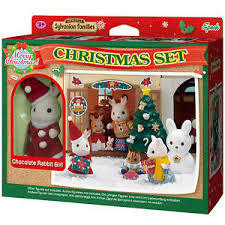 It includes Freya, the chocolate rabbit girl dressed in a beautiful red dress and hat. 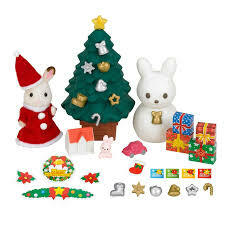 There are some cardboard pop out wreaths and garlands for attaching to your Sylvanian house front door. It would have been nice to have a 'proper' wreath...the type you get as card toppers from craft shops but the cardboard ones were pretty enough. There is a lovely free standing Christmas tree complete with little ornaments to attach and some little cardboard parcels to fold and put under the tree. 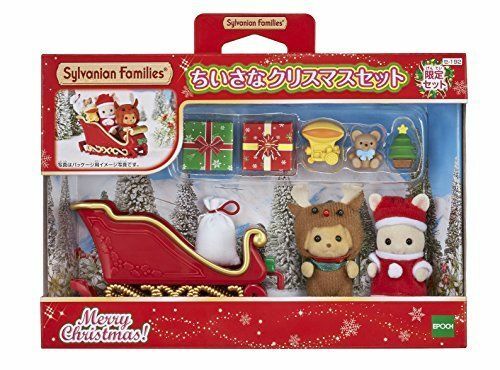 I LOVE that one of the little presents supplied is a Sylvanian Family toy sized Sylvanian house! A really diddy little miniature. The children loved putting the Christmas items in their houses (the set seemed to move from house to house to prevent arguments). It retails at £19.99 which to be honest I think is a bit too expensive. If you can track it down for around the £14 mark I would say it's a good deal but I'm not sure it's worth £20. Having said that it really is a lovely addition for any collector. 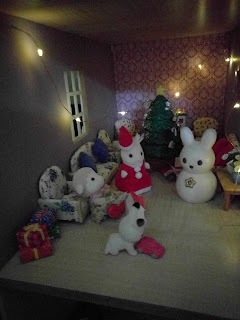 The Sylvanian Families Christmas set in use...this time in the dolls house. ....anyone off to Japan?! Just look at that sleigh! NB - I was not paid for my review although the set was sent to me to review. These are my own opinions.